Successfully Added Gadget Grey Skype Mouse VOIP Phone - Sliding Cover to your Shopping Cart. 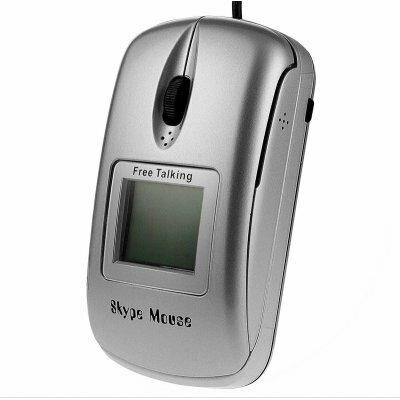 Skype Chat Phone Accessory in a gadgety grey color that works both as a standard 800 DPI Mouse and as a high quality VOIP phone with a unique sliding cover for easy transferring from mouse function to calling. It is a perfect add on if you are constantly using Skype for calling another computer or another phone, and with the backlit LCD Screen you will constantly be getting useful information such as contact details, time, and call duration, and all in any language that your Skype program is running under. Also featured are the large speaker for listening to music or voice and a smaller 20mW if you need more privacy. A great accessory to make chatting online that much easier, and available at great wholesale discounts direct from Chinavasion..